Wild multiflora roses are considered a nuisance by hunters who have to trudge through the thorny plants. Orchardists who labor to remove them from along fence lines share the same sentiment. But a change of attitude is taking place around apple, pear, and cherry orchards in parts of Washington and Oregon. 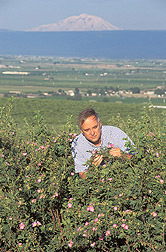 There, some growers are actually planting wild rose gardens next to their orchards. There's a method to such madness, though. The gardens are actually part of an areawide study that Agricultural Research Service (ARS) and Washington State University (WSU) scientists are conducting to bolster spring populations of tiny, parasitic wasps that attack several leafroller moths in tree fruits. 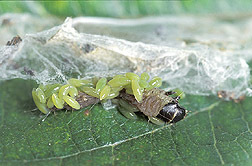 In the caterpillar stage, the moths eat the leaves and fruit of apple, pear, or cherry trees, sometimes causing yield losses greater than 50 percent. In heavily infested areas of central Washington, tree fruit growers may need to spray their orchards two to four times a season to check the pests' appetite for destruction. But results emerging from studies by entomologists Tom Unruh and Bob Pfannenstiel, of ARS, and Jay Brunner, of WSU, suggest that making these orchards more hospitable to the parasitic wasps could ease or even eliminate the need for spraying leafrollers. "I'm convinced we can do away with most sprays," says Unruh, with ARS's Tree Fruit and Vegetable Insects Research Unit in Wapato, Washington. So what's the rose bush garden got to do with anything? The gardens, in the researchers' scheme, serve as a kind of winter sanctuary from which the wasps can emerge en masse during the spring. The wild roses' job is to shelter strawberry leafrollers, a secondary host on which the wasps rely for room and board when the temperatures drop.This story began when Brunner, who directs WSU's Tree Fruit Research and Extension Center in Wenatchee, Washington, discovered the wasp, Colpoclypeus florus, parasitizing leafrollers in central Washington. This tiny wasp is a native of western Europe and found its way into the United States sometime after 1968, when Agriculture Canada scientists released it in the Ontario region to biologically control redbanded leafrollers. While harmless to nonhost insects, the wasp stalks its leafroller prey with the agility of a big-cat predator. The hunt starts after a female C. florus wasp has mated and picks up the chemical scent of the leafroller in its lair, a leaf rolled onto itself with silk spun by the caterpillar. The wasp must take care, however, because the caterpillar is 20 times larger than she is. And, it can be quite belligerent about intruders. When the time is right, "She jumps onto the back of the leafroller and stings it just behind its head. She then jumps off and hides in a safe spot," explains Unruh. If she isn't nimble enough, the leafroller may rear back and snap her in half with its jaws. "It's a real battle; it's like early hunters trying to spear a mammoth," says Unruh of the 1- to 2-millimeter-long wasp's attack. "Almost all the time, the leafroller succumbs." But the wasp's sting isn't what delivers the killing blow. Rather, her sting is the means of "injecting toxins that change the behavior of the leafroller so it starts making extra-thick webbing," Unruh explains. Once the silken web is to her liking, he continues, "The wasp starts laying her eggs in the webbing out of range from damage by the host. About 20 wasp larvae hatch from the eggs, crawl down the webbing to the leafroller, and start sucking externally on its body." After 1 to 2 weeks of such feeding, the young wasps pupate, then emerge as fully formed adults in another week. These mate and then fly off to start the cycle over again. In summer, parasitism of apple leafrollers in the orchard can exceed 50 percent. But winter poses a problem for the wasp in western orchards. Until recently, the researchers couldn't figure out why the wasp's springtime parasitism rate was very low (just a few percent)—a bottleneck to its use as biocontrol agent, since apple leafrollers generally produce only two generations during the season. (K10904-2) "This is an old problem," says Unruh. "In Europe,C. florus is the main parasite of leafrollers, but there's nothing in the scientific literature regarding where, and on which host, the wasp survives the winter. Our leafrollers in apple are not suitable winter hosts because they overwinter as very small larvae, too small for the wasp." The first clues to the mystery surfaced in the fall of 1997, when Robert Pfannenstiel, then a WSU postdoctoral researcher with Brunner, did some scouting along the banks of Squilchuck Creek, which winds past hillside orchards of apple, cherry, and pear outside Wenatchee. There, among wild roses, dogwoods, and other native plants that favor riparian habitats, Pfannenstiel collected some leafroller larvae of a size apt to suit the wasp's overwintering needs. That day, "I collected two or three specimens and actually found a female C. florus attacking the leafroller," recalls Pfannenstiel, who has been a full-time scientist with ARS's Beneficial Insects Research Unit in Weslaco, Texas, since June 2000. Given the lack of scientific information on the wasp's winter hosts, "it was a kind of big deal," he says of the observation. From this and later collections, Pfannenstiel identified two winter hosts for the wasp: Syndemis species that feed on a native dogwood and Ancylis comptana (strawberry leafroller). The strawberry leafroller is an exotic species that favors domestic and wild strawberry and several native varieties of wild rose, particularly Rosa woodsii. Neither is a pest of apples, but they share a common trait: large, mature larvae the wasp's brood can feed on in fall, allowing them to enter diapause, or hibernation, and survive until spring. 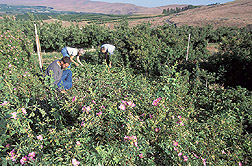 From these clues, Pfannenstiel and Unruh, in 1999, started a 2,471-acre survey of orchards near the Yakima River to test the hypothesis that parasitism of apple-feeding leafrollers by C. florus would be highest close to riparian habitats, where both wild roses and the wasp's winter hosts could be found. More importantly, three-quarters of this large orchard area is next to sage-grassland habitat, not riparian. There, scientists observed virtually no springtime parasitism by wasps of the apple-feeding leafrollers. In July and August 2000, Unruh's team planted 10- by 50-foot gardens of wild rose and strawberry at four survey sites farthest from the Yakima River banks. These were sites where no spring parasitism by C. florus had been observed. After establishing the gardens, the team seeded them with strawberry leafrollers. 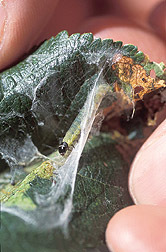 Specimens collected the following December and in February 2001 showed C. florus had parasitized the strawberry leafrollers in three of the four gardens. More importantly, the following May, they observed parasitism of apple leafrollers in the orchards near the three garden sites. 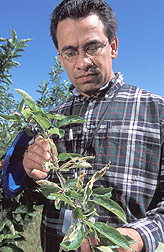 At the Annual Western Orchard Pest and Disease Management Conference held January 2003 in Portland, Oregon, Unruh described the study and contrasted the findings with earlier observations: In orchard areas close to the garden where no strawberry leafrollers had been parasitized, there was also no C. florus parasitism of apple leafrollers. What's more, no apple leafroller parasitism was observed in garden-free orchard sites used as controls. This spring, the researchers have expanded the study to include 10 new rose/strawberry garden sites near Yakima, and two gardens each in Milton-Freewater and The Dalles, Oregon, and in the northern Okanagon area of Washington. Unruh says growers excited by the prospect of less insecticide for leafroller control have planted their own gardens in Royal Slope, Sunnyside, and Columbia basin sites of central Washington. The researchers are helping these volunteer efforts by making sure that the strawberry leafroller becomes established at these sites. "It's been a groundswell," notes Unruh of the response. But "just planting roses isn't enough," he adds. More research needs to be done, including on the ecology of the garden itself. For example, strawberry leafrollers do best as winter hosts for C. florus when a few wild strawberry plants are mixed in with the rose bushes. Problem is, wild strawberry is low growing and much less hardy than the rose, which adds another interesting wrinkle. "In mixed patches of roses and strawberries, we found that 5 to 10 percent of leafrollers in strawberries had been parasitized versus almost 100 percent of those in the roses," says Unruh. "The parasite seems to look for its hosts in bigger bushes and trees rather than in ground cover." Other research includes tests of more than a dozen different kinds of wild roses and strawberries to identify which ones will work best in the gardens. The test plants are found naturally, purchased from nurseries, or obtained from the USDA plant germplasm center in Corvallis, Oregon. The team is also working on spray strategies that will protect the wasps, tachinid flies, and other beneficial insects if use of chemical controls for other pests, such as codling moths, is unavoidable. As the approach takes shape, says Unruh, "I think it will have a substantial impact on how we manage leafrollers in western tree fruit orchards. "—By Jan Suszkiw, Agricultural Research Service Information Staff. This research is part of Crop Protection, Product Value, and Safety, an ARS National Program (#304) described on the World Wide Web at www.nps.ars.usda.gov. Thomas R. Unruh is in the USDA-ARS Tree Fruit and Vegetable Insects Research Unit, 5230 Konnowac Pass Rd., Wapato, WA 98951; phone (509) 454-6563, fax (509) 454-5646. "Rose Gardens Make Fruit Orchards More Inviting to Friendly Wasps" was published in the January 2004 issue of Agricultural Research magazine.